You are at:Home»Herbs»Anethum graveolens Linn. Latin name : Anethum graveolens Linn. The Dill seed is a wonderful medicinal herb which has tremendous value in a number of remedies. The seed of dill is used to make ‘dill water or tea’ for the treatment of indigestion, flatulence, hiccups, stomach and menstrual cramps, insomnia, colds and most important COLIC, to those of you with young infants. 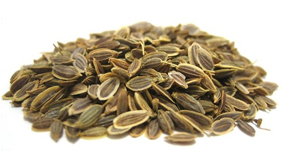 Dill seeds is also used to stimulate milk production in nursing mothers. Dill weed contains numerous plant derived chemical compounds that are known to have anti-oxidant, disease preventing, and health promoting properties. This popular herb contains no cholesterol and low in calories. However, it is contains many anti-oxidants, vitamins like niacin, pyridoxine etc, and dietary fibers which help to control blood cholesterol levels. It is also rich in many vital vitamins including folic acid, riboflavin, niacin, vitamin A, ß-carotene, vitamin-C that are essential for optimum metabolism inside the body. Dill makes a useful addition to cough, cold and flu naturals and is a mild diuretic. It stimulates the flow of breast milk in nursing mothers and when taken regularly by nursing mothers, helps prevent colic in their babies. Contraindication : Some people are sensitive to this herb and may develop a minor skin rash. If this occurs, discontinue use. Avoid during pregnancy.